Physical books are still an important asset of the vast majority of libraries. Without a more appealing way of displaying your books, the print titles that are shelved spine-out may spend their lives hiding from potential borrowers. Is your library taking advantage of opportunities to showcase what’s in your print collection? “It may seem trivial, but the work you put into your displays is just as important (and arguably more important) as the work you put into collection development” (Fiscus, 2018). Certainly, curated displays are an effective way to highlight materials on current or special events. However, even without researching display books, purchasing new display shelves, or making space for dedicated display furniture, there are ways to use your current shelving to call attention to titles. The goal is to highlight the most visually appealing part of your print collection—the cover—in ways that will encourage your library users to look twice. As the area for nonfiction was redesigned and shelves were moved, the library also completed a heavy weeding project. Now each aisle has eye-level displays, some of them extending the entire length of both sides of the aisle. This strategy works because the nonfiction section is a heavy-traffic area, given its proximity to several service areas. I can personally attest to this; I discovered a book while walking through the area that I still recommend to others! I would not have looked up The Sound of a Wild Snail Eating in the PAC, but reading this book absolutely enriched my life. Whenever a staff member notices that a book is missing from the display area, another is added in its place, which requires constant vigilance and upkeep. However, replacing titles is easy because books are chosen to highlight a cover, not chosen based on topic. Also, the Reference Department regularly roves the nonfiction area, so staff members are in the stacks frequently. While useful for adult nonfiction in a busy area, this method can be applied to any collection that needs a bump in popularity. Depending on the size of the collection, it does take an investment of time to complete the transition. 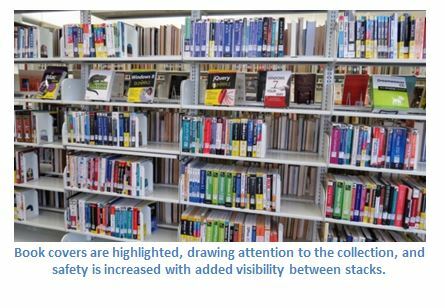 When there were no other pressing priorities, SCPL spent about three months of shelf-shifting time to move content on approximately 845 square feet of shelving. 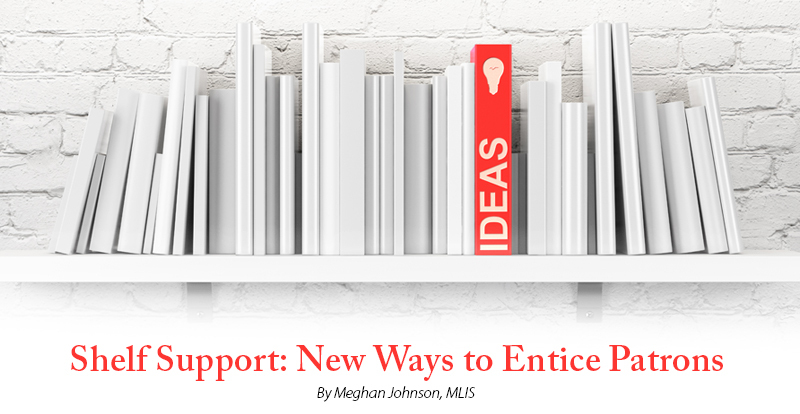 If you do not have enough time, staff power, or space to clear off entire shelves throughout any of your collections, there are other ways to promote books with existing shelving. A simple way to display book covers is to use the space at the end of a shelf after the book end. This is a good strategy to highlight single copies. However, if you have multiple copies of a great book, particularly one with a visually appealing cover, you can use a shelf block to highlight that title like they do at the Edmonton Public Library of Alberta, Canada as part of their merchandising practices (Thomas, 2016). The idea is that you keep the title you want to showcase in the same place it would normally be shelved, but you face the cover out to highlight the front of the book. This type of display is more visually striking if you have multiple copies of a title. When stacking copies, the top copy is more in-line visually with the edges of the spines surrounding it. If your shelves do not have backs, you can purchase or make shelf blocks. 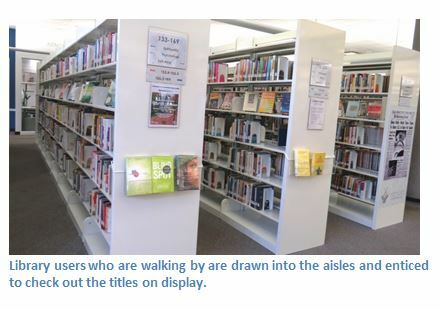 For more information about how to implement this strategy, as well as for images of shelf blocks in action, see Tina Thomas’s article, We Share Great Stuff: Marketing Content at the Edmonton Public Library. Several Anythink Libraries in Adams County, Colorado, use a method in their popular browsing collection that even reconsiders the side of the shelf where items are placed. Instead of only lining up spine-out books from left to right, some titles are right-justified, shelved to the far right, which gives patrons a visual cue to look more closely at the content. Director of Customer Experience Suzanne McGowan explains, “Staff members are empowered to use merchandising guidelines to add visual interest to the collection” (personal communication, April 27, 2018). This method of visual merchandising works well for Anythink because they use neighborhoods to organize materials on clusters of shelving. While the majority of shelves are left-justified, some right-justified shelves are “sprinkled in,” McGowan says. This is a great strategy to encourage your library users to take a second look at what’s on your shelves. Consider this method for an area where titles will face out into the library for maximum visual impact. For more information on Anythink’s visual merchandising, check out the Anythink Tank on their website. There are many creative ways to showcase your print collection that do not require you to spend additional funds or make space beyond your existing stacks. By drawing attention to the covers, you will help get resources off of the shelf and into the hands of a person. What ways has your library found to creatively add displays into your existing shelving areas?